Shopify has developed a bit of a reputation as an expensive eCommerce platform. And it’s true that you can find some providers who’d be able to design you a decent-looking store for less. But here’s what I think: Shopify is well worth the (not considerable) extra expense. Why? Because penny pinching gets you nowhere. As Shopify developers ourselves, choosing an inferior product just because it saves you a few dollars a month is cutting off your nose to spite your face. Why do I think that Shopify is a good deal? Primarily, because when it’s actually compared to other similar platforms, there’s no real discrepancy in price. There are three different price points available: Basic, Professional and Unlimited, which come in at $29, $79 and $179 each respectively. By comparison, at $35, $75 and $135, Volusion’s products are slightly more expensive at the basic end and nearly $50 cheaper for its most advanced platform, Premium. Offering an option to purchase annually (which Shopify doesn’t offer), Volusion also allows you to take a further 10% off that price. And on the face of it, it’s only Volusion’s bandwidth (at 35GB) that’s trumped by Shopify’s unlimited storage. Volusion also earns brownie points by waiving commission rates, which can be between 1 and 2% on Shopify, depending on your payment system. However, as well as being less impressive aesthetically (more on that in a bit), Volusion’s design templates are markedly more expensive than Shopify. Some Volusion templates cost nearly $1000, while the most expensive Shopify option is just $180. On the other hand, with plans at $29, $79 and $199, Bigcommerce is around the same price as Shopify – although, like Volusion, its option to pay annually makes it more expensive by just 95 cents. Again, Bigcommerce follows Volusion’s lead and forsakes transaction fees – something that makes it financially more attractive than Shopify. Feasibly, if you had a yearly turnover of $100,000, you’d be paying between $500 and $2,000 back to Shopify, depending on the Shopify plan you choose. What’s more, the fact that you have to purchase many Shopify features that come ‘out of the box’ free on Bigcommerce ensures that you will spend less honing your site than with Bigcommerce. With its most advanced plan at just $16.66 a month, Webs is even less expensive, while WooCommerce, a plugin that adapts WordPress for eCommerce stores, is completely free. How could Shopify be improved? And so there are a number of ways that Shopify could represent better value for money for online entrepreneurs. Although they were abolished last year, Shopify’s supplementary fees have recently been reintroduced and remain a bone of contention for many users. The percentages (either 0.5%, 1% or 2% depending on whether you’re on the basic, professional or unlimited plan) can deter many ambitious businesses and don’t compare well with competitors. Getting rid of transaction fees, or at least providing ways to circumvent them, would do wonders for making Shopify better value. Likewise, many of the apps that can make Shopify a market leader (more on that in a bit), cost money. You’ll find yourself shelling out between $30-$200 a month, depending on the app. Shopify’s fans maintain that its blank canvas, upon which you can install all the supplementary apps you want, is a great feature and including more apps as standard would drive the price up. Although it’s possible to make your own apps, it’s unfortunately a skill that’s beyond the majority of pop-up shop options. But as far as I’m concerned, none of them truly rival Shopify – which comes with a range of exclusive, market-leading features. In 2014, every website needs to be mobile friendly if it’s going to maximise traffic and keep users on board. However, some providers still don’t enable automatic responsive design for mobile users. Volusion, for instance, requires users to access their shop’s administrative area in order to make the site and its checkout area ready for mobile usage. And Bigcommerce requires a customisation process to make its sites mobile ready. This process isn’t particularly hard, but it’s a little fiddly and is more work than you should have to do. Happily, Shopify is completely compatible on mobile devices, with complete functionality and secure shopping carts while still retaining the design of your desktop site. It goes without saying that your online shop simply has to look good. 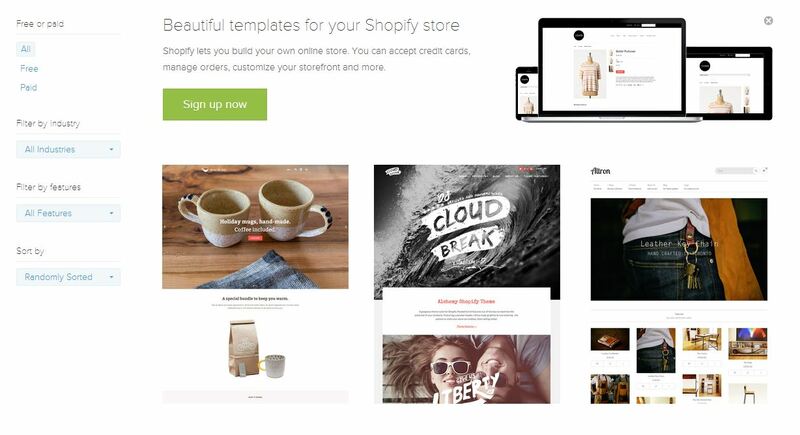 Thankfully, when it comes to aesthetics Shopify does more for web developers than any other provider. You can choose from around 100 different themes when building a Shopify store – each of which come with a range of colours. Around a third of these themes will be available free of charge, while others will set you back a one-off free of around $150. So while you may have to pay for a design you’re really enamoured with, it’s not a huge cost. 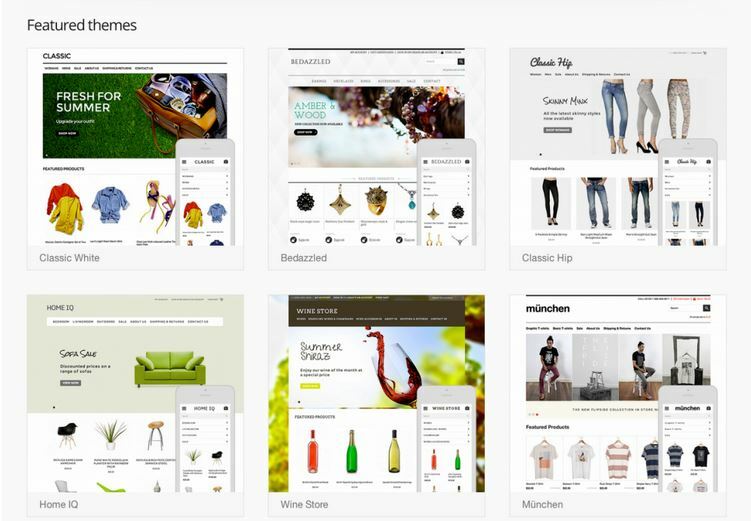 Unlike other providers, Shopify sub-contracts the design of its themes out to professional designers. Because they know the platform inside out, the themes created by these experts are some of the cleanest, most modern designs available on the market. Bigcommerce, probably Shopify’s biggest rival, has traditionally been its much uglier sister when it comes to design. And although it’s recently stepped up its approach with the much-improved Bigcommerce Next, it’s still a far way behind. As you can see, the themes are clean, clear and engaging, but they still don’t have the spark and modernity found in these Shopify designs. Unlike other providers like Bigcommerce, who will only allow you to edit specific parts of web pages, Shopify’s specialist ‘liquid’ code allows webmasters to do as they see fit with their site’s design. You can also make as many changes as you like using HTML and CSS. However, it’s true that Liquid is a completely different way of doing web development and can be a little tough to get your head around at times. If you’ve plenty of web dev knowledge, you’ll still find it takes time to learn this new language — which isn’t for everyone. But given time to play around with the smallest details, you’ll agree with me that Shopify’s language is one of the most adaptable and extensible out there. Shopify gained a significant advantage over its rivals when it introduced its very own offline Point of Sale (POS) system in September 2013. That means that bricks and mortar stores can turn an iPad into a cash register and seamlessly link their offline shop with their online space without worrying about logistics and inventories. A few years back, some developers avoided Shopify because its track record with search engine optimisation wasn’t the best. For instance, it prevented webmasters from changing title tags, meta descriptions and image alt tags on a web page — seriously restricting a shop’s ability to get results. Nowadays, there are none of those issues. Meta information, alt text tags and URLs can be adapted and optimised as you see fit. And unlike some other cheaper providers, Shopify’s completely clean code means that it’s easier for Google’s ‘spiders’ to crawl your site and rank it for relevant search terms. You’ll doubtless have noticed that blogging is becoming an increasingly essential part of modern SEO campaigns. 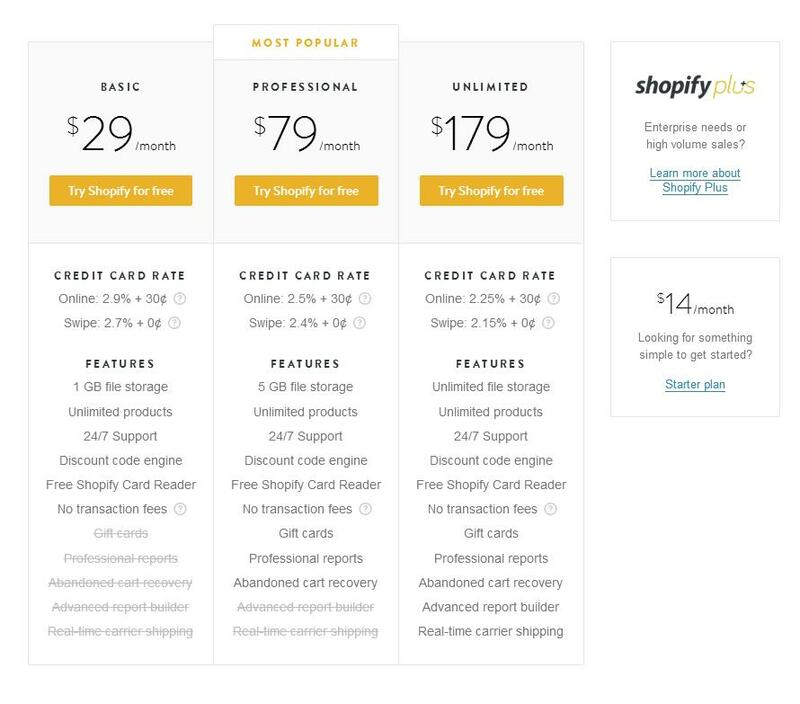 Here again, Shopify leads the charge against other paid options. SEO-wise, Shopify’s blog functionality really sets it apart from other providers because of where its blogs are situated. While the likes of Bigcommerce and Volusion are only able to put blogs on sub domains (as blog.yourcompanyname.com) a Shopify blog will sit on the same domain (as yourcompanyname.com/blog). This means that, generally, you’ll enjoy better rankings on content written on same domain blogs and links to your blog will convey more authority in the eyes of Google. The extent to which links to subdomains are devalued remains a topic of much contention in the SEO community, but links to same-domain blogs will be more beneficial to a site than links to content built on a subdomain. There are currently more than 100,000 websites out there being powered by Spotify. That means that when you’re in need of advice there are plenty of people who’ve been there and done that. The final point is a crucial one. If you’re a developer that’s always looking for new ways to sell online, you’ll find that you’ll be able to do so quickest with Shopify. When you need to speak to someone at Shopify, that’s really easy too. You can speak to a knowledgeable member of staff 24/7 who’ll be able to help you out, chat live online or browse its huge array of support topics. While Shopify shines when it comes to features, this is one area where it can get a little more costly. Compared to Bigcommerce, for instance, Shopify is a little more basic when it comes to ‘out of the box’ eCommerce trickery. You’ll have to pay for some features that are available free of charge on Bigcommerce. But the costs aren’t particularly substantial – varying from around $10 to $100 a month. And Shopify’s app store is a developer’s paradise that makes up for the initial lack of options. Whatever plans you have for a site, Shopify’s community ensures that there is, to borrow a phrase, “an app for that”. Once you’ve gotten to grips with the app store, you’ll find Shopify offers far more innovative features than other providers. In my opinion, the store proves the old adage true: you really do get what you pay for. Have you built sites using Shopify before? How did you find the platform? Talk to us in the comments below. Based in Newport, South Wales, and Miami, Florida, TheGenieLab is a web development agency that offers specialised shopify development, innovative eCommerce solutions for agencies and businesses in the UK, US and across the world.